These last four cookies that I managed not to stuff into my mouth straight from the oven sit proudly on the Fury platter that my nephew made for me for my birthday. I totally cried. I adapted this from 101 Cookbook's Carrot Oatmeal Cookies. Combine all the dry ingredients in a large bowl. Peel and finely mince the ginger and add to the dry ingredients. Gently heat the maple syrup and coconut oil in a glass measuring cup in the microwave until the coconut oil is melted, about thirty seconds. Stir the syrup and oil into the dry ingredients until just combined. 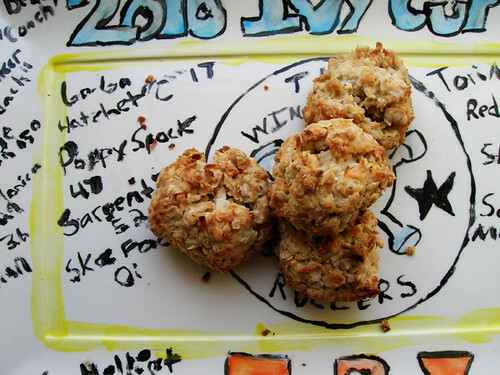 Lightly roll tablespoons of dough into balls and place on an ungreased cookie sheet. Bake until golden brown, about ten to twelve minutes.